Caltite appears to be a bitumastic emulsion. There is no doubt that where it bakes dry it protects concrete and the steel within for decades, possibly for centuries. The examples Cementaid mostly cite are above ground in sun-baked Australia. My concern is that they promote the benefits of dried Caltite in situations they know it will not dry or work, and a guarantee as the best in the market when it may be completely bogus. In 2005 I was sent the Caltite specimen guarantee of that time. You can view it here. Given that concrete at least as good as C35A is supplied, there is nothing else in the Everdure Caltite guarantee that I can see leaves any room for a claim. 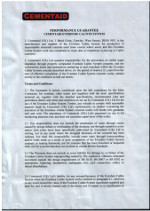 The guarantee letter follows a standard form signed at Caltite pours, reproduced at the bottom of this web page, denying any supervision or responsibility for workmanship. As well as costing about twice any other water-resisting admixture, users have to buy their hydrophylic or metal strip for all joints as well. But Aldred (who was once the technical director of Cementaid, and has the same surname as the founder), in a 2001 paper, found that the use of Caltite in concrete with a water/cement ratio of 0.4 was found to reduce water transport only when the concrete was dried before testing. Source: "The influence of integral water-resisting admixtures on the durability of concrete" 2013. The Concrete Society, p26. "Aldred also concluded that the use of Caltite may not be effective in reducing water transport for concrete with a low water/cement ratio and no opportunity to dry before exposure, such as diaphragm walls. The diffusion of water vapour through the Caltite concrete was shown to be similar to the control concrete." The inference is clearly that Caltite does nothing to waterproof the already-watertight concrete mix that customers are told to order. The first two clauses we have reproduced, taken together, make it clear that you cannot just accept the statement that the product is suitable without considering the rest of the certificate which we feel proves the product is not sufficient on its own. which surely means not necessarily attained in all situations. This clause seems to exclude the Caltite from the equation. None of these figures are any better than what the Concrete Society called typical structural concrete. These quotes are all from the Caltite product certificate on the BBA web site here. But we have changed the order in which they appear. This Certificate relates to Everdure Caltite for integral concrete waterproofing incorporating hydrophobic and pore-blocking components. The product is suitable for basements, roofs, swimming pools, tunnels, and culverts, without the requirement for additional applied protection. 7.2 Concrete made with a high water/cement ratio can have a water vapour permeability above 3000 x 10–12 gm (Ns)–1. The permeability of concrete is highly dependent on the exact mix design; the figures given in the Technical Investigations section, Table 1, indicate the levels that can be obtained using the product. 11.3 The effect of the product for a specific mix and site conditions should be evaluated through site trials prior to use. For Grade 3 (where control of water vapour is required), it will be necessary to provide a mix with a sufficiently low vapour permeability in combination with an adequate section thickness (see sections 7.2 and 7.3). The use of suitable ventilation, dehumidification or air-conditioning, appropriate to the intended use, must also be considered. 10 years on their guarantee seems to have changed very little. This guarantee was issued during 2015. 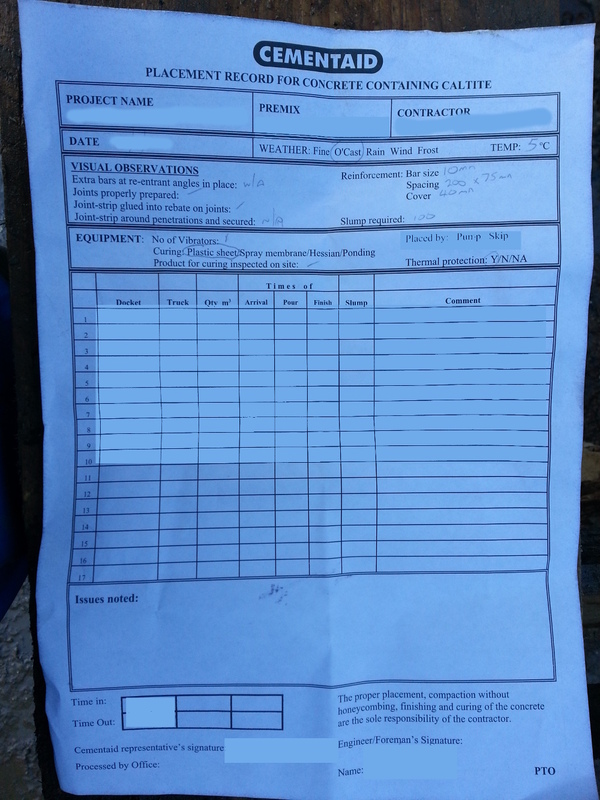 BBA certificates have figures for water permeability. The Concrete Society had the idea of plotting them all on a chart. We have done that as well. But we have also included some best guesses. For instance, only the Caltite certificate has no figures for compressive strength. The BBA appears to have added Caltite to a concrete that, even with the Caltite in, is still more permeable than typical structural concrete and all the other concretes they later added other admixtures to. They added Sika admixture to concrete that even with the product in was not as resistant to permeability as the plain concretes other admixtures were added to. 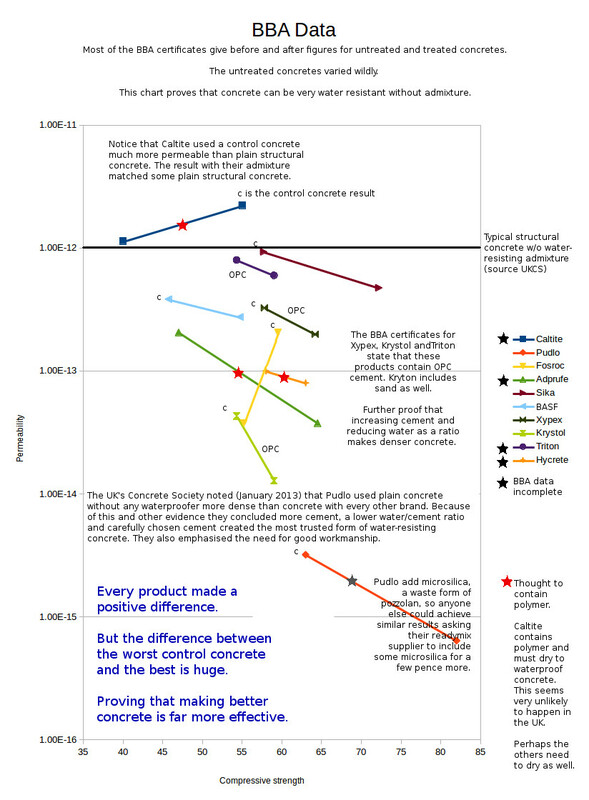 The concrete Pudlo was added to outperformed all the others even before the Pudlo was added. 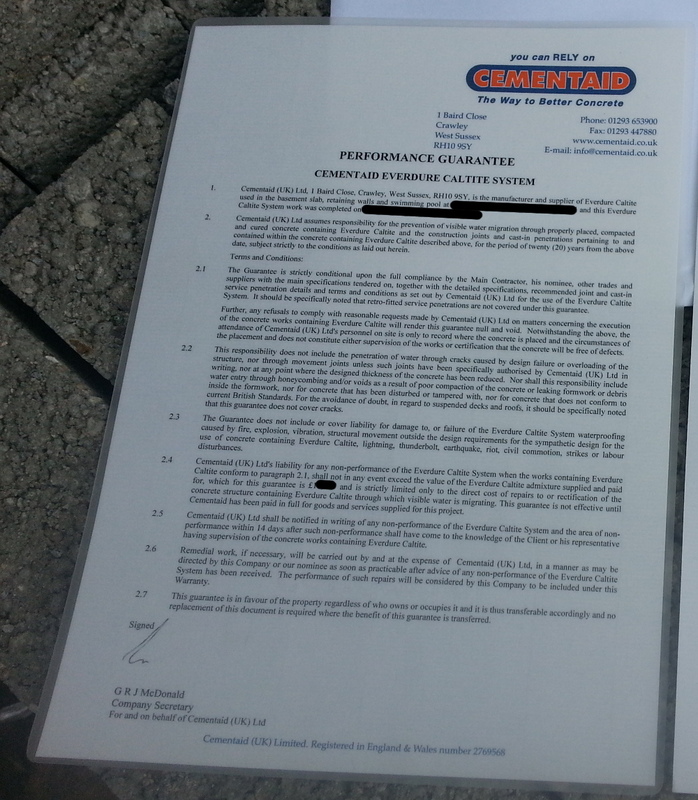 I don't wish to say that this disclaimer is unfair, only that specifiers seem to think that Cementaid provide a guarantee far beyond that which they actually provide.